We have officially managed to get to the second edition of the history series where we give overviews on how popular fishing brands started out and what has contributed to their success. Now we are going to take a deeper look into famous brand named Penn and its Penn angling tackle, fishing Penn spinning reels and rods. If you missed the first article about Shimano company the you can reread it here. If you have ever had a Penn Spinfisher or Battle then I am sure you are familiar with the durability and heavy-duty style. Penn Reels love to make serious saltwater reels but do you know why or how are you familiar what Penn`s main focus point was when the company was just starting out? Let`s go over the history and find answers to these and many more questions. Unlike with Shimano, Penn was always meant to be a direct fishing reel company. Its founder Otto Henze was dreaming about creating his own tackle from quite early ages but this wish did not manifested itself until 1932 when he created the Penn Fishing Tackle Manufacturing Company. His first reels were designed for surf fishing and they were called simply as Model F and Model K.
Only after years later Penn productions gained some more momentum and Model F turned to Sea Hawk, Model F changed name to Bayside and Long Beach depending on version. Why don´t reels have names like these in nowadays? Still these products weren’t something special and Penn did not have true break through moment until the famous baitcaster Senator was launched. 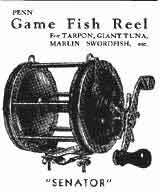 Back then it was specially designed for saltwater game fish just like it is today. Senator really took off after it was used to land several world record catches. Then the second big hit came in 1961 when Penn Reels launched a new spinning reel – Spinfisher 700. This same model was direct forerunner for Spinfisher V.
1986 a new trademark drag washer technology named – HT100 – was born. This is the base feature spinning reels like Battle II have. Penn Reels climbed to the top and are still staying there in terms of saltwater fishing. Their reels have helped to set 1,400 IGFA world records. No other tackle producer can`t even come close to this number. These same fishing reels, especially Senator, is still widely used by charter boat captains and other serious ocean anglers. In recent years Penn has slowly been making a strong presence in saltwater spinning reel market too: Spinfisher, Conflict, Conquer and two saltwater reels of the year models: Torque in 2006 and recently launched Battle II chosen by ICAST in 2014. If Penn has gone from offshore only tackle to some inshore models, then who knows maybe we can see a Penn`s freshwater reel in couple of years. Nobody can argue that Penn isn`t a leading offshore reel producer and what makes this fact more interesting is that it has entirely different background compared to Shimano. Penn was a completely fishing focused company right from the start founded by extremely motivated angler who has fulfilled his goal by coming up with irreplaceable fishing reels. Yes, I have to admit that compared to your book here: http://www.whitefishpress.com/bookdetail.asp?book=198 our short article definitely seems superficial and “weak”. However its purpose was to give a basic overview on the History of Penn brand and reels. If any reader out there is looking to get even more detailed history about Penn then by all means guys, check out the whitefishpress book. Thanks for the link and I will be sure to check out some of these books too!